Learning Articles » How Can I Improve Blood Circulation? Well, there are many methods to improving your blood circulation that can all tie in to your overall health. In these articles we will outline some methods that will help you to improve blood circulation. Did you know that poor blood circulation can actually be one of the causes of muscle soreness? There are many different elements that can cause your muscles to be sore like not drinking enough fluids or even some exercise. But one of the causes that people often overlook is lack of proper blood flow. In fact, muscle soreness can be one of the ways your body let’s you know that you need to improve blood circulation. By enhancing your circulation in your feet and legs you can reduce the pain and swelling, and feel more energized and refreshed the next day. If you are ill or older or if you have a more sedentary lifestyle you may find that these factors have led to tired or aching legs as well as conditions such as swollen feet and ankles and poor circulation. To achieve good health and regain your active lifestyle, you need to improve your circulation. 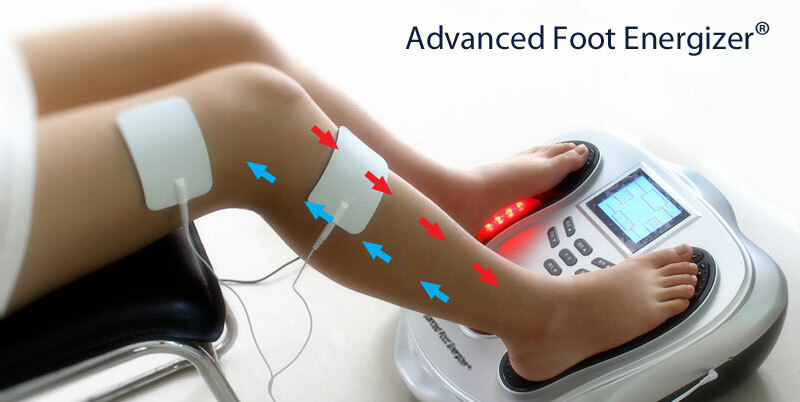 By using electrical muscle stimulation (EMS modes 1 – 8 on the Advanced Foot Energizer) you will effectively stimulate your feet and legs increasing what is called the venous pump. These programed modes are designed to produce a changing electrical current. This essentially switches your muscles on and off, causing them to contract and release repeatedly. This nearly replicates a normal physiological activity such as walking or like getting a massage. While this does not replace regular exercise, it is a valuable addition to your routine. It can also serve as a way to increase circulation for those who may not be able to participate in regular physical activity. For many, it is a way to help increase muscle conditioning and balance so that they can once again regain an active lifestyle. As you are activating and releasing your muscles you are getting consequential increases in blood flow in your feet and legs like you would experience with exercise. And just like a massage, you can improve your blood and lymph circulation and your relaxation response. This has the effect of delivering more oxygen and nutrients to you muscle cells and relaxing the muscle tissue. Using The Advanced Foot Energizer regularly will help condition your muscles by improving the capacity of your vascular system. With more vessels your body can deliver more oxygenated blood so that your muscles last longer and perform better. By creating non-fatiguing muscle contractions the Electrical Muscle Stimulation will dilate blood vessels leading the way to increased blood flow. The increased muscle activity also helps remove waste away from the area. Regular conditioning can also make it easier to begin or complete exercise programs or other desired activities. Using electrical stimulation for 25 or more minutes a day will begin to have noticeable effects. You may easily use it multiple times a day in locations such as under your office desk or while watching television. Faghri, Pouran D. et al. Abstract: The purpose of this study was to compare venous blood flow velocity of intermittent pneumatic compression to electrical stimulation of the foot. A prospective randomized controlled study of 40 healthy volunteers was conducted. Subjects were seated for 4 hours during which they received electrical stimulation of the sole of the foot or knee-high intermittent pneumatic compression. Popliteal and femoral venous blood flow velocities were measured via Doppler ultrasonography. Blood flow velocity in the nonstimulated or noncompressed lower extremity served as a simultaneous control. For both the femoral and popliteal veins, the electrical foot stimulation group exhibited a greater increase in blood flow velocity than the intermittent pneumatic compression group. Electrical foot stimulation was noninferior relative to standard intermittent pneumatic compression. Specifically, this result of a greater increase in blood flow velocity is achieved at time = 120 minutes for the femoral vein (t = 2.70; p = .005) and time = 120 (t = 2.75; p = .004) and 240 (t = 2.27; p = .014) minutes for the popliteal vein. Short-term electrical foot stimulation is at least as effective as knee-high intermittent pneumatic compression in increasing popliteal and femoral blood flow velocity. James J. Czyrny; Robert E. Kaplan; Gregory E. Wilding; Christopher H. Purdy; Jack Hirsh – Vascular. 2010;18(1):20-27. * prophylaxis – action taken to prevent disease, especially by specified means or against a specified disease.